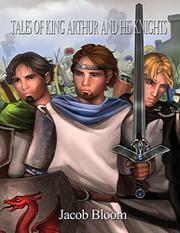 In rhyming verse, this debut children’s book tells how the legendary King Arthur, Sir Gawain, and Sir Lancelot began their journeys. Every hero needs an origin story, and Bloom’s debut children’s book offers those of a sovereign and two knights of the Round Table. The basics are familiar: the sword in the stone, Arthur’s discovery of his kingship, King Lot’s opposition and his son Gawain’s choice to defy his father and serve Arthur, the forming of the Round Table and its “new rules for knights,” and Lancelot’s battle against a giant before he joins Arthur’s men. Each section centers on a personal test of courage. After pulling the sword from the stone, for example, young Arthur—moments ago only a squire—must face skeptical, battle-hardened warriors, claim the crown, and remind them they vowed to serve his father, the king: “Now as his son I call on you / To live up to your word! / Now kneel, and take your oaths again / Before my royal sword!” It takes moral courage, too, for Gawain to stand by his oath and defend Arthur; he’s also thoughtful about the destructiveness of war. And although Lancelot has never been in a real fight and wonders whether he’ll be scared, he fights bravely in a long, hard-fought battle, even when his shield is split. Bloom keeps the story moving along briskly, bringing in plenty of emotion and excitement along with musings on oaths, loyalty, and courage. The battle scene with Lancelot, the giant, and other knights is particularly dramatic and clearly told. The verse, which mostly scans well, is generally written in quatrains rhyming ABCB, though the occasional double rhymes of ABAB stanzas are effective, as when Lancelot encounters an enemy soldier: “But he looked up and spotted me / With my spear aimed at his face / And he decided he’d rather be / In some other, safer, place.” The book lacks illustrations, though, which would have added another dimension to the text. A thoughtful, exciting work with pleasing rhyme and rhythm; a nice addition to Arthurian literature for kids.